New York Times bestselling author Debbie Ford starts her most personal, powerful, and practical work to date sharing how she was confronted by her own fears upon a grave cancer diagnosis. 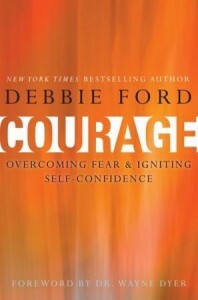 The process she undertook to overcome her insecurity and fear and unlock the courage that resided within her all along serve as the foundation for her latest book Courage: Overcoming Fear and Igniting Self Confidence. Supports us in discovering that what keeps us stuck and feeling weak is nothing more than an illusion of the past. Shows us how to be confident, stand in our strength, and feel great about ourselves, allowing a new self emerges with the power to accomplish anything. Teaches us how to employ seven guiding principles to avoid common pitfalls of fear and insecurity, transforming them into strength, power and freedom that has been present all along. Debbie Ford has been helping people break free from the emotional baggage that holds them hostage and discover self-confidence and authentic self expression. She is the national bestselling author of Dark Side of the Light Chasers, Secret of the Shadow, Spiritual Divorce, The Right Questions, The Best Year of Your Life, Why Good People Do Bad Things, and The 21-Day Consciousness Cleanse, and the coauthor of The Shadow Effect. She conducts workshops and trainings around the world supporting lifelong personal, spiritual, and emotional education and transformation. She lives in San Diego with her son. More at www.debbieford.com.